Melbourne-born Kat first discovered yoga in 2008, thanks to a small studio in Costa Mesa, California, whilst travelling regularly to the USA for work. It was there her yoga mat became her home away from home - a place where she felt comfortable in body and mind, despite being so far away from family and friends. At the time she was completely unaware of the extent that yoga would transform her life. All she knew was that every time she stepped onto her mat, the complexities of life seemed to all but dissipate. ​Kat’s curiosity to explore how and why yoga had this profound effect on people paved the way for a further decade of constant practice and study in the USA, Sydney and Melbourne. Her passion and determination to share her knowledge and experience in yoga led to completing Yoga Alliance RYT200 training at Yoga Plus (now known as The Base Yoga), Vinyasa training at Australian Yoga Academy, and more recently training with Laughing Lotus in New York as part of her Yoga Alliance RYT500 certification. 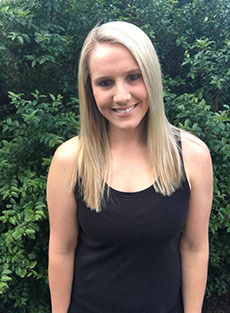 In 2016, Kat founded Yoga State Of Calm, a nurturing private yoga space in Melbourne’s south-eastern suburb of Berwick, where she assists members of the local community with their yoga practice, in particular those with injuries or illnesses that may be fearful of attending a busy studio environment. Kat facilitates workshops and retreats across Melbourne as part of her business and also teaches regularly at The Base Yoga. Kat’s teaching style can be quite a grounding experience, yet prepare yourself to be challenged. Each of Kat’s classes is a journey of self-enquiry with an abundance of mindful movement and breath-work, where freedom and expression during flows is creatively encouraged (courtesy of her childhood that included 18 years of dance). She allows you to explore your own uniqueness on the mat and at times helps you to uncover strengths you may never have known existed within yourself. With Kat you will be guided through not just a physical practice, but towards a life of fulfilment, where the mind is still and an ultimate sense of peace is achieved regardless of external stimuli. The ancient yogis call this the journey towards ‘samadhi’ (the final attainment of ‘being’). This is where the magic happens.